With iPhone’s outstanding features, businesses can write their success stories with the assistance of simple yet powerful iPhone applications. Stellen Infotech has a team of certified and experience iPhone developers who can help you witness the magic of digital world leave its mark on half of the populations. Our iPhone developers have in-depth technology knowledge and expertise to deliver only the best possible solutions. Having worked on a variety of projects and with different clients from numerous geographies and industries, we understand the current demands and requirements of today’s businesses. We, at Stellen Infotech, follow a modular approach to develop, implement and execute successful iPhone apps. Stellen Infotech has managed to earn the trust and faith of many clients, thanks to its multifarious iPhone app development services. For building the best app imaginable, our team of experienced developers starts the process of application development by designing aesthetically appealing design that boasts of incredible user experience. By concentrating on how your customers would communicate with your business, we guarantee that your applications fulfills your business objectives such as increased revenue, customer retention and customer engagement. When you hire our iPhone developers, they ensure that everything from application designing to development to testing offers an added excellence. Use our advanced iPhone game development services to build diverse games that can foster your business and improve numerous important skills. Online booking apps developed by our iPhone and iPad application developers smoothen the booking system and improve your business workflow. Make your business social media friendly to reach the masses and give your sales a boost with our social media incorporation application services. Run a travel and tour business? Our travel/tour application development services are designed especially to cater to your travel based business and broadens its horizon. Our feature rich and highly robust and secure e-commerce smartphone applications streamline your e-store business efficiently while helping you target iPhone and iPad users. Our team of highly skilled, experienced and talented iPhone and iPad application developers are proficient enough to handle any type of application development including education based apps, learning management system or more. Have a look at few of our recent projects and see for yourself why they have chosen Stellen Infotech for iPhone Application Development. How our top-notch services make use the leading iPhone development service provider? We certainly live up to the marks of businesses when it comes to delivering desired business goals. The wide scope of today's digital market has persuaded us in accomplishing only the best solutions for varied businesses. Vast experience in building website, web applications and mobile applications, from custom sites to e-commerce apps, fulfilling the demands of 10,000+ clients. 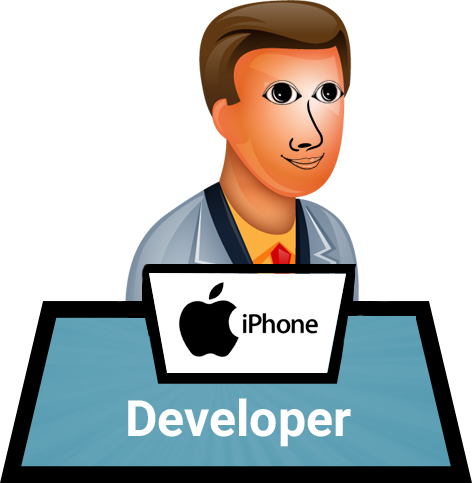 Why Hire iphone app programmer? Obviously, the more platforms you cover the more people you can reach. We, at Stellen Infotech, offer solutions that help you reach the masses in lesser time. handle any type of development project.